SPECIAL REPORT / The US Ambassador to the EU told the European Commissioner for Trade today (15 May) that there is hardly any chance that financial services will be included in a future Transatlantic Trade and Investment Partnership (TTIP). Commissioner Karel De Gucht, responding to a question put by EURACTIV at the European Business Summit (EBS), said the EU would continue to push for financial services to be part of the landmark trade deal. But Anthony Gardner said the US Treasury’s position was clear. To a backdrop of anti-TTIP protests outside the summit, both men said they wanted the final TTIP deal agreed by the end of next year and before the US elections. This was technically feasible and there was a window of political opportunity, De Gucht said. Both also launched blistering attacks on NGOs and other organisations, who they accused of spreading “lies” through “social media.” The commissioner also blamed European Parliament electioneering for colouring the debate over the landmark trade deal. He said, “You should not underestimate that this is now all mixed up with the European elections. You have the campaigns by the social media, groups using the social media, a number of NGOs spreading sometimes, I would say, complete lies, for example on hormone meat. De Gucht criticised the Social-democrat Commission presidential candidate, Martin Schulz, for saying negotiations should be suspended because of the elections. The parliament was regularly and would continue to be regularly informed, he said. De Gucht added that an agreement over broad principles in a free trade agreement for financial services would ensure that EU and US regulation would be finalised in a consistent manner. “We are of the opinion that financial services should be part of TTIP, obviously the US side is very reluctant to do so, claiming we have discussions in the Basel Committee and that is enough,” he stressed. The Basel Committee is a global standard setter for banking regulation. “We need to agree ways to go forward to translate agreed principles. We are going to continue pressing for that,” De Gucht added. Ambassador Gardner said that the EU and the US shared a common interest in making sure regulation is consistent and that it largely was. “The dialogue is being continued in various fora. We think the discussion is important and can continue on that basis […] we don’t see the need for financial services to be part of TTIP,” Gardner added, noting that the US Dodd-Frank act, its translation of existing Basel standards for banks, was moving at a faster pace than its EU equivalent. “We would stress we need a common approach to avoid discrepancies in the future. I don’t really agree with the Dodd-Frank argument. A major part of Dodd-Frank is before several courts in the United States. It’s not a problem we can’t solve together,” he added. 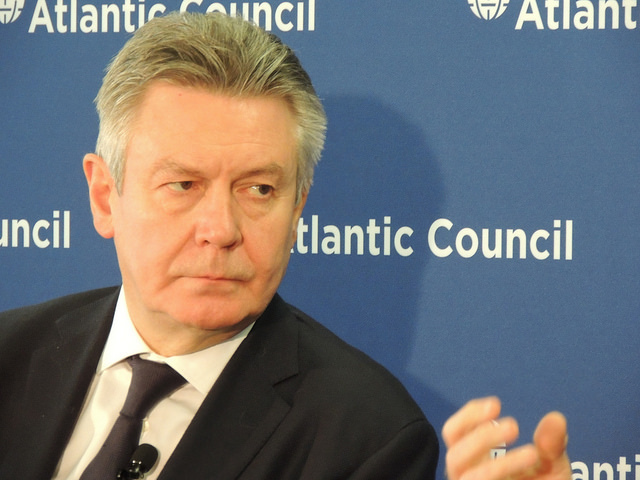 De Gucht was backed by Tim Bennett, Director-General of the Transatlantic Business Council, who said his organisation supported the inclusion of financial services. But Gardner poured cold water on those hopes. He said: “There is an interest to ensure we remain aligned. Financial services is a key industry, a key creator of jobs on both sides of the Atlantic. TTIP is touted by its supporters as the first 21st Century trade agreement, which will set a standard for all future agreements to follow. Examples cited included that TTIP would force Europeans to eat “chickens washed in chlorine” or GM foods. Wait, an investment partnership without financial services? What else do they want to invest? The truth is that the agreement would not “force” Europeans to eat poultry slaughtered under US standards. Nor would any other move of the EU to lift the ban on US (chlorinated) poultry. Consumers still have their choice. Communication like that is not acceptable in Europe and we should not tolerate that.